Britain declared "a digital music nation" as digital singles account for 99.6% of sales | What Hi-Fi? The use of social media and the rapid rise of downloading music has turned Britain in to a ‘digital music nation’, according to a new report released. In the British Phonographic Industry (BPI) Digital Music Nation report, it is revealed over a quarter of the population have purchased downloads or streamed content legally in the last year. A total of 938m singles and 114m albums have been sold as digital downloads to date. By contrast, sales of CDs, DVDs, Blu-rays and video games fell by 17.6% in 2012 – although they still account for around three quarters of the home entertainment market. BPI chief executive Geoff Hurst described Britain as “blessed with a world-beating array of digital music services,” as it emerged that digital now accounts for a massive 99.6% of singles sold. 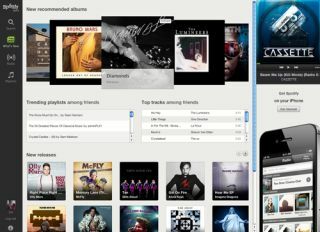 Online streaming was also praised in the report, revealing that UK music fans have streamed more than 3.7 billion tracks in 2012. Music streaming services are now worth more than £49m to British record labels, accounting for over 15% of digital trade income. Four out of five (80.6%) of consumers have heard of at least one streaming service, with Spotify, which recently announced a new design, way out in front in terms of public awareness. 68.8% of people had heard of Spotify, closely followed by 63.8% awareness for Napster, 34.4% for last.fm, 13.0% for Deezer, 12.8% for we7 and 11.7% for Rdio, which recently announced a free service for the UK. In the UK, Edinburgh residents were revealed as the biggest users of Spotify (per-capita), followed by Cardiff, Southampton and London. The report comes as HMV continues to struggle, with administrators yesterday announcing it was to shut 66 HMV stores, with scores of staff being made redundant. No surprise perhaps, with the BPI report claiming almost one in five consumers have fully transitioned from physical to digital music, preferring to buy all their music in digital format. New data showed the average music spend of legal only music consumers (£33.43) to be substantially more than the spend of filesharers (£26.64).